Observed near Nairobi, Kenya, July 2014. 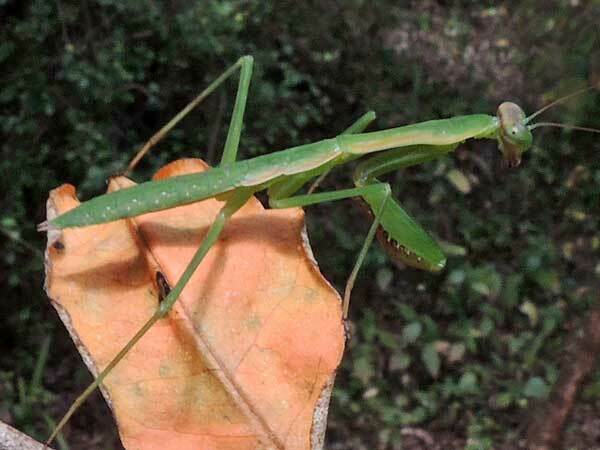 Praying Mantises are alert, visual predators. The head rotates freely by more than 180°, keeping the photographer, naturalist or potential victim in view. The first pair of legs, held as if the insect were praying, are set to snap and lethally retrieve an insect prey. This one is camouflaged to blend into the green vegetation upon which it hunts using a sit-and-wait method.